The BN forex scandal was reported in the Far East Economic Review in 90s, I subscribed the monthly magazine to bypass all censorships imposed by Mahathir. In one time, I did visit US Embassy’s library to read all dirty news about Mahathir. Bank Negara lost RM33 billion in forex speculation game to George Soros and other crocodiles. Only a change of government will uncover the scandal and put those responsible to jail. An ex-Bank Negara insider reveals the inside track on the currency speculation undertaken by Nor Mohamed Yakcop and other powerful people about 20 years ago. 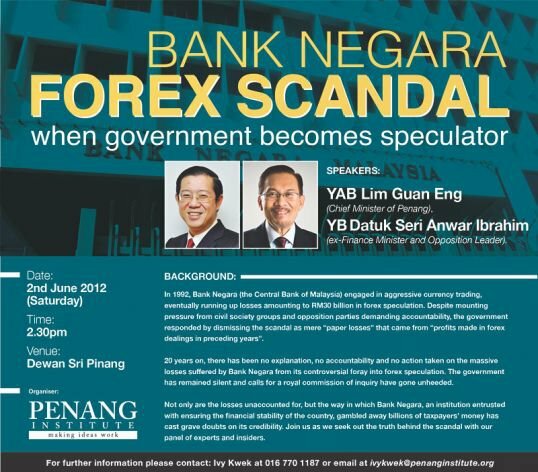 GEORGE TOWN: A former Bank Negara insider has named four powerful elites as main players to have caused the central bank’s massive RM30-billion loss in the international foreign exchange speculation scandal some 20 years ago.